I bounce around in cyberspace from time to time, visiting interesting forums and blogs mostly. A few of you have perhaps seen recent posts out there in which I am seemingly going alarmist with regard to the current food supply situation. Some may think it's some kind of self-serving hoo-hah. I understand that. That's why I've always tried to stay grounded and unattached to most of the scares-of-the-day that roll in and roll out regularly. My mantra has always been to get prepared ... to do it in a way that fits your budget and to do it over a period of time, systematically, logically. Get there and you'll find peace of mind ... so whether you ever have to count on your preps to actually survive, you will certainly have at least gained the assurance and well-being that comes with preparedness. Well, I've now reached the conclusion that the time for that approach is past. There is growing panic in the preparedness and food marketplaces, and I believe it's becoming more plainly visible even at the local grocery store, etc., now. My own company and my preparedness-providing peers have been swamped with brand-new near-panic-stricken buyers for the last couple of months. Supplies of many types are dwindling--and in some cases gone now. Prospects for replacing many of the stocks are at least a few months off. That of course assumes that demand levels off. The problem is, there is no sign that will happen. In fact, panic begets more panic. It feeds off itself. As supplies become harder to get and prices rise, more and more people become determined to get "theirs". We're seeing it now. The fear out there is getting to me. I'm as fully prepared as I can possibly be, but I mull what all this means to our communities, our relatives, our country. That's what is scaring me more than anything else right now. I've been trying to find a counterbalance among my peers out there--my own suppliers, etc. I want someone, anyone, to tell me that there is a light at the end of the quickly darkening tunnel. I've gotten a couple of small "maybes" attached to big "ifs". MAYBE things will turn around for the better by fall IF a bunch of things go just right in the ag and economic worlds and no other wrenches are thrown into the works. But all are telling me confidentially that my company should buy as much food and prep stock as I can afford right now before further price spikes and stock depletions put the whole business at risk. Also, unbidden, they are saying that I need to buy as much of the kind of food at the grocery store that I normally depend on to feed my family as they see panic buying about to become the norm, quickly magnifying the food shortage issues. To put this plainly--I am not finding the reassurances or hope I desperately have been seeking. So I am relaying this info now to you, my friends. Buy groceries and food, buy other daily necessities as much as you can afford now. I feel like the guy with the sandwich board that says "the end is near". I doubt it's the end ... but that's not the point. There is a strong probability that feeding people in America is about to become a far different proposition than what we are all used to. Consider that as being a burden dropped off my shoulders at your feet. TWO Brand New MH 3-Case Variety Kits to Choose From! Added NOTES: -- Oregon Freeze Dry will again be raising Mountain House food prices this summer. No surprise, since of course all food prices are skyrocketing, including MH's supplier prices. So consider that in your emergency food planning. -- By May 1, Mountain House canned foods will be on backorder for up to 3 months due to very high demand and the transition of OFD's production capacity to products for their other markets. In mid-April, however, we are still seeing orders being delivered within the normal 2-3 week period. We're conducting another one of our ever-popular Mountain House group buys ... this time on TWO brand new 18-can, 18-variety packages. Choose either one or both and get the widest variety of top-quality emergency storage foods available, at the lowest possible legal price. You can't get these anywhere else. We put them together for our best customers only, and this time, we're offering two different packages. To join the buyers club, it's just a one-time $19 fee--and you get 20% off everything in the store plus free shipping to the lower 48 all the time! This group buy will run through April. The 3-case kits are already shipping out to our customers as early as April 14. Whether you buy-in on these special three-case deals ... or you opt for some of our other excellent packages ... or you decide to custom-build your own order from our MH listings ... do please consider acting soon before we are again forced to increase our prices and/or MH backorders extend to several months. H5N1 Critical In Indonesia; New Strains Emerging, Pandemic Form in Sight? ROME (AFP) - The bird flu situation is "critical" in Indonesia, where the virus could mutate and cause a human pandemic, the UN food agency warned on Tuesday. "The prevalence of avian influenza in Indonesia remains serious despite (national and international) containment efforts," the Rome-based Food and Agriculture Organisation said in a statement. The FAO's chief veterinary officer, Joseph Domenech, said he was "deeply concerned that the high level of virus circulation in birds in the country could create conditions for the virus to mutate and to finally cause a human influenza pandemic." H5N1 is endemic across nearly all of the sprawling archipelago nation, and of the total 105 human deaths reported there, 11 have occurred this year alone. "The human mortality rate from bird flu in Indonesia is the highest in the world, and there will be more human cases if we do not focus more on containing the disease at source in animals," Domenech said. "Indonesia is facing an uphill battle against a virus that is difficult to contain," the statement said, urging improved surveillance and control measures. "We have also observed that new H5N1 avian influenza virus strains have recently emerged, creating the possibility that vaccines currently in use may not be fully protecting poultry against the disease," Domenech warned. At the risk of pointing out the obvious ... people everywhere are now getting VERY serious about laying in supplies and gear for lean times ahead. Prices are going up fast, risks are growing in the marketplace, and the world geopolitical dynamic is more precarious than ever. I say this to our friends now--it is too late to be ahead of the wave crashing in to shore, but if you start paddling right now, you can catch it and ride in with the crowd on that leading edge moving enmass to get crisis preparations completed. Suppliers everywhere are being swamped with orders. Products are increasingly on back order. And everyday now the customer orders pile up. Act without further delay if you need something to complete your storage program--food, gear, whatever it is. You may have to wait a bit to get your order completely filled, but the alternative is far worse. We've been working for months on getting a whole new buyers club website up and running that would be a bit more useful and customer-friendly. Buyers club members are registered there and they should have received their log-in info March 11 by email (passwords have changed from the previous store site). Members, please email me at jcrefuge@safecastle.net if you need your new login info again. 1. We have a bunch of new products in the new store. 2. Member pricing is more evident (mouse over the main product listing image). 3. And no coupon codes are required, as once you log-in, your discounts will be applied. We used a web template made for wholesale businesses. Wholesaling is a reasonable facsimile of what we do with our buyers club, so it served as a good model, and we believe the resulting site is an upgrade from the previous store (which is still live for the next couple of weeks at www.safecastleroyal.com). In two weeks, assuming nothing major emerges as problematic at the new store, it will be moved to the safecastleroyal domain and the old store will be taken down. * One cool thing that is new is the integration of video into the store. We have added several to the site, to include a club-intro video and several product-related videos. More will be added as we find good ones. Hope you'll visit and have a look at what we've added. 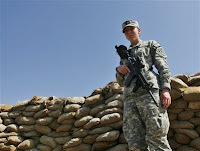 CAMP SALERNO, Afghanistan - A 19-year-old medic from Texas will become the first woman in Afghanistan and only the second woman since World War II to receive the Silver Star, the nation's third-highest medal for valor. Pentagon policy prohibits women from serving in frontline combat roles — in the infantry, armor or artillery, for example. But the nature of the wars in Afghanistan and Iraq, with no real front lines, has seen women soldiers take part in close-quarters combat more than previous conflicts. For Brown, who knew all five wounded soldiers, it became a race to get them all to a safer location. Eventually, they moved the wounded some 500 yards away, treated them on site before putting them on a helicopter for evacuation. Photo caption: Paul James, 85, standing beside some 200 cases of Mountain House freeze dried food. Purchased and trucked all the way cross country from Oregon in 1975, this "mountain" of food was recently pulled down from where it was stored for 37 years. This photo was taken July 29, 2007, moments before the mountain was loaded into a moving van headed back across the country to Idaho. My wife and I are in our 80s and our daughters, who live in Idaho, felt it was time we joined them. In August, 2007, we moved with all of our belongings and 227 cases of 37- year-old Mountain House freeze dried food. First we opened a can of peas. The moment I heard the swish air flowing into the can and felt their pellet-like hardness, I was convinced no air had entered the can for 37 years. The peas were fine. We checked the blueberries and found them to taste exactly as we remembered them in 1975; the strawberries also kept perfectly. Since then we have twice served the scrambled egg mix. The added flavor of butter and salt were perfect to our taste. Are we again approaching uncertain times that could affect the food supply? Will my decision to "stock up" during the Cold War 37 years ago soon be transformed from folly to fortune? Note: Several sources are reporting that food grains will be in short supply this year because farmers have planted so much government-subsidized, GMO corn for ethanol. JC: The math is wrong in this article--"75 to '07 is 32 years, but the main point is, the stuff lasts "forever." The nation’s growing dependence on corn in fuel as well as food could put the nation in perilous economic straits in the event of a Midwestern drought, economists say. “We are replacing price volatility from the Middle East with Midwestern weather price volatility,” said Michael Swanson, a Wells Fargo & Co. vice president and agricultural economist. Corn is a key element of the U.S. food supply. Dairy cows eat it to make milk, and hens consume it to lay eggs. It fattens cattle, hogs and chickens before slaughter. It makes soda sweet. As the building block of ethanol, it is now also a major component of auto fuel. Analysts warn that a “corn shock” could lead to $5 gas and $3.50 eggs as the effects reverberate across the economy. It could happen as soon as this summer. “The risk of a drought right now is higher than normal because of the La Niña we are seeing,” said Bruce Babcock, an agricultural economist at Iowa State University, referring to the cooling of ocean temperatures that often has a drying effect. Such would occur against a backdrop of soaring prices for basic food items and other commodities that are already stressing the economy. Coffee, platinum and oil prices are already up dramatically. After a torrid 2007, corn prices have risen an additional 20 percent this year because of global demand for livestock feed, sweeteners and ethanol. The rush by American farmers to forgo other grains to plant cash-producing corn, along with weather problems, has squeezed wheat supplies, pushing the price of that grain up 21 percent. Soybeans have risen 25 percent. Analysts are already simulating what would happen if a drought hit the Corn Belt. Babcock estimates that corn could reach $8 a bushel from $5.46 now. As any farmer can tell you, Mother Nature is fickle. The U.S. has suffered four major weather disasters since 1971 that wiped out 21 percent to 29 percent of the corn crop at a time. Bad weather, including droughts, scorching heat waves and cold, cloudy spells at just the wrong time, has reduced harvests by billions of bushels. Previously, these disasters have raised food prices. The next drought will be the first to affect gas prices. That’s because ethanol — mostly refined from corn — will make up about 6 percent of the nation’s gasoline supply this year, and that’s expected to rise to 10 percent over the next five years. But if there were a crop shortfall, the rising price of corn would prevent ethanol distillers from earning a profit, prompting them to slash production, Babcock said. Oil companies would have to scramble to fill that sudden gap with conventional gasoline. Prices would soar for both fuels, said Philip Verleger Jr., an energy economist in Aspen, Colo.
OK ... But what's the BAD News? (PressZoom) - WASHINGTON, Feb. 27, 2008 – The Pentagon’s top intelligence official today told a Senate committee the United States is operating in a security environment that is “unusually complex.” During a hearing before the Senate Armed Services Committee here, Army Lt. Gen. Michael D. Maples, director of the Defense Intelligence Agency, presented an analysis of current and future threats facing the U.S.
“That threat spectrum is bounded on the one side by traditional nation states with significant military inventories, and on the other by non-state terrorists or criminal networks that exploit the gaps and seams between nations, cultures, laws and belief systems,” he said. Outlining what he called “trends of concern,” Maples said current threats include weapons of mass destruction, increasingly sophisticated and longer-range ballistic missiles, improvised bombs and suicide weapons, outer space and cyberspace vulnerabilities, and underground weapons systems produced by potential adversaries.